ATMA 2019: ATMA is a national level entrance exam conducted by AIMS. ATMA stands for AIMS Test for Management Admissions. ATMA entrance exam is being conducted multiple time in a year. ATMA December Exam Dates Announced and Registration will start soon. Latest Update: Due to the election, The ATMA 2019 May Exam has been preponed on Saturday, 18th May 2019. It will be conducted probably 5 times in next year also. ATMA is known as a single-window test for providing admissions to various PG management courses. It is a gateway to get admission to MBA/ PGDM/ PGDBA /MCA /MCM courses in more than 200 institutions. ATMA December session Registration process is already started, and all the events and their dates are already announced with the ATMA Official Notification pdf. All the interested candidates need to fulfill ATMA Eligibility Criteria to fill the application form and appear in the entrance exam. All the candidates must be completed graduation from a UGC recognized University. They also need to obtain at least 50% marks in above. Candidate must have a minimum required age of 21 years. Candidates appearing in final year of graduation or complete CA are also eligible for the test. 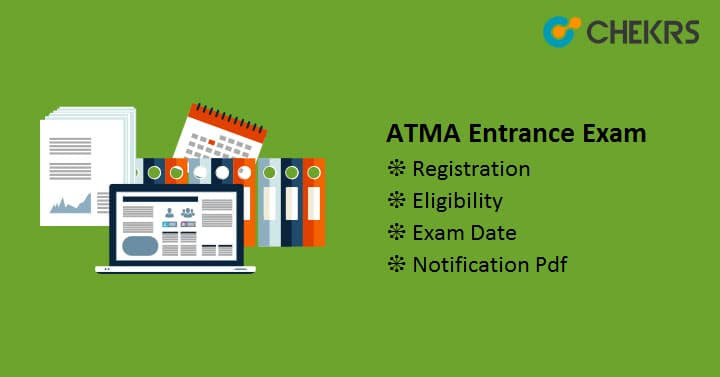 The ATMA Registration Procedure is being conducted through online mode. First of all candidates needs to visit the official website and then they have to find the link for the registration form. Where they need to enter their Mobile number and Email to register them. On the same page, they will need to fill all the basic details like name, Mobile number, Email id, DOB etc. After registration candidate will receive a mail on the provided Email. The Email will have login Username and Password. The candidate has to use these details to log in to the official website atmaaims.com to follow the further process. ATMA 2019 Registration Fee: ATMA Registration Fee is around Rs. 1298/- (Including 18% GST) . It can only be paid through the online mode via Debit/credit card. The Registration fee is not refundable. We are also providing ATMA Exam Pattern to reduce your searching. The exam will be conducted through the Online mode other details are given below. The ATMA Syllabus will be based on verbal reasoning, numerical reasoning, analyzing and synthesizing ability. There will be 6 sections in the Question paper. Each section will consist of 30 Objective Questions. Once you start preparing, the most important thing is to cover the entire syllabus before the exam. Divide the syllabus properly in small Topics, then cover the Topics day by day. Make your own notes and solve ATMA Previous Year Question Papers. Make strategy over Time Management, Do not waste time. Be confident, be positive and believe in yourself. Admit card is being available on the official website from 3rd July: 11 AM. ATMA Admit Cards for August Session can be downloaded till 5th August: 2 PM. Candidates have to visit the official website and log in there. After it they will need to access the admit card and download it. After downloading the admit card candidates need to take a print of it. Candidates have to also affix passport sized photograph on it. The ATMA 23 December Hall Ticket will be required at the examination center to appear in the exam. The exam authority will also release ATMA Answer Key on the Official website. The candidate can download the answer key by logging to the official website. the answer key will consist of all the answers to the paper. candidate can match their responses and also they can estimate their marks before the result. ATMA entrance exam’s August Session result will be released on 9th August 2019. The ATMA August Result will be available on the official website. Candidates have to visit the official website and log in there to access and check their ATMA 2019 Result August. Enter the PID along with the password. Candidates can also check their Section by the result on the same official website. The ATMA Scorecard will be available on the official website. It will be not available through offline mode or it will be not delivered through the post. There are more than 200 institutes which consider ATMA Scorecard for providing ATMA Admission into MBA/ PGDM/ PGDBA /MCA /MCM courses. After the result declaration scores will be reported to the candidate and the Institutions in three weeks in the case of the Offline mode of the exam and in between fifteen days in the case of the online mode of exam. The admission will be provided on the basis of ATMA Entrance exam score.